You will receive one yard. If you buy more than one yard, I will send it as one continuous piece. Purple cotton fabric depicting Hamburgers and Fries. Each 1/4 yard measures approximately 18"X22". 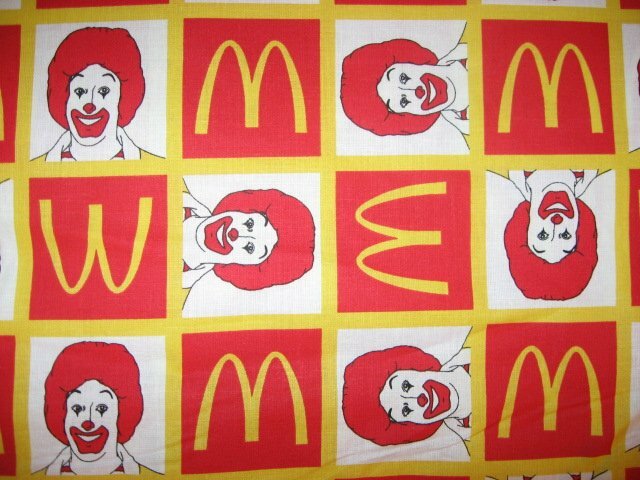 I have other types of McDonald's fabrics listed in my store. You are buying one quarter of a yard. It measures approximately 18" X 22". PLEASE NOTE: You will receive one quarter of a yard. If you buy more than one of these fat quarters, I will send them as one continuous piece whenever possible. Block form cotton fabric, depicting Ronald.